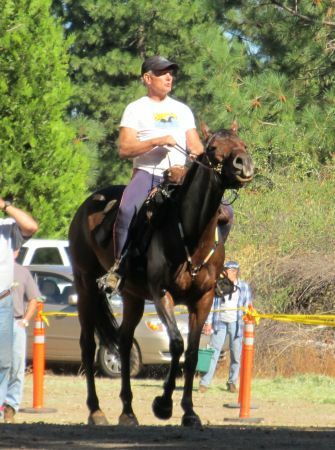 October 8th 2011 was spent working on my farmer’s tan watching 175-odd horses and riders set forth on the [winterized] Tevis Trail. The 20 mile loop out of Foresthill was the make-or-break for many riders and the 1,800′ jaunt down and up Gorman Ranch Road (not part of the usual Tevis Trail) was – as expected by locals – one of the toughest parts of the trail. Deceptively trottable, it nonetheless took a lot out of many horses. Regardless of position, how long it took to reach pulse criteria coming into this check would dictate when they would be allowed to leave, refreshed after the hour-long hold. Jeremy Reynolds (the eventual winner of this year’s ride) arrived moments before the others but also dropped to pulse criteria first, so he would be first out at 2:58 pm. I went over to take photos. Jeremy and Riverwatch were already waiting to go and I positioned myself just down from the out-timer to get a shot of them–me thinking they’d leave at a fast walk or maybe a trot. 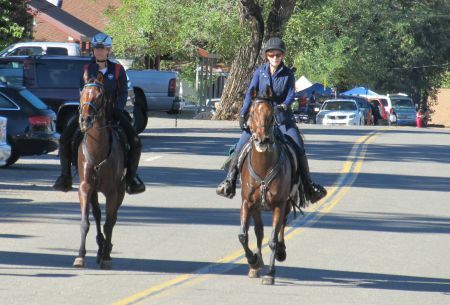 “Go” yells the out-timer and they shoot out of there at a fast canter, around the corner, down the hill – on pavement. Ack! Thank goodness for Glue-Ons. Next up is Rachel Shackelford, only a minute behind on her veteran horse, BR Cody de Soi. Apparently last year Rachel was running in third place and slipped on the pavement riding through Foresthill. Cody went down and the scrapes he sustained forced them out of the race. I thought for sure such an incident would cause her to rethink Cody’s footwear, but, nope, she’s still in steel shoes <squeak>. Just before she leaves, she laughs with someone and says she won’t slip this time. She departs at a fast trot, Cody slithering slightly on the pavement. Ack, I think, crinching up my body in angst. (OK, so maybe this is a personal paranoia, but I’m convinced that any horse in steel shoes will automatically fall over if it does more than amble on pavement. Cody, however, has completed over 4,000 competition-miles during which time he has likely developed some balance skills, eh, Lucy?). Rachel Shackelford and BR Cody de Soi. Three minutes later, Dennis Summers and OMR Tsunami (Lola) get to leave and this time I can relax – Lola’s in full Glue-Ons so no slippage for them at an extended trot. 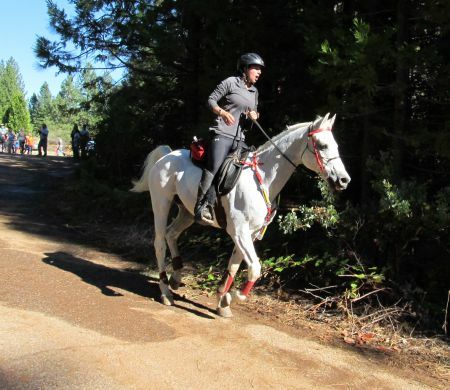 Because of the rerouting of this year’s trail, riders had to deal with more paved sections than usual and I’m sure the booted riders were glad for both the cushioning and the extra traction. At the very beginning of the ride, riders had to cross the paved Highway-49 after crossing No Hands bridge going the “wrong” direction. Word at the ride meeting the previous evening was that riders would be asked to dismount to cross this road. 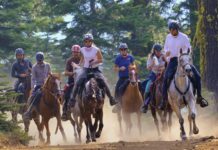 My thought was “well, that won’t be necessary for horses in boots, bummer.” Apparently ride management changed their minds, however, and dismounting wasn’t required after all. 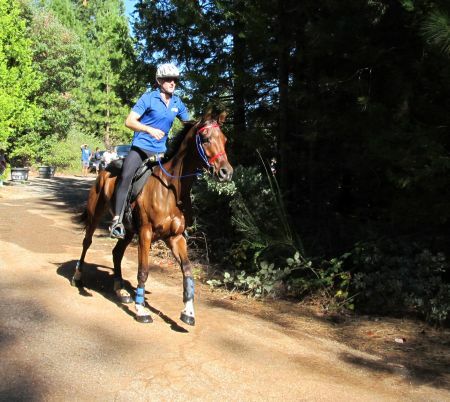 So many of the front runners came through Foresthill at a canter, but luckily many of them were also wearing glue-ons. Glue-on-ed Jennifer Nice (Stella) and Jenni Smith (Bear) coming through Foresthill the first time. Given my own personal paranoia, there’s no other way to go where pavement is concerned.